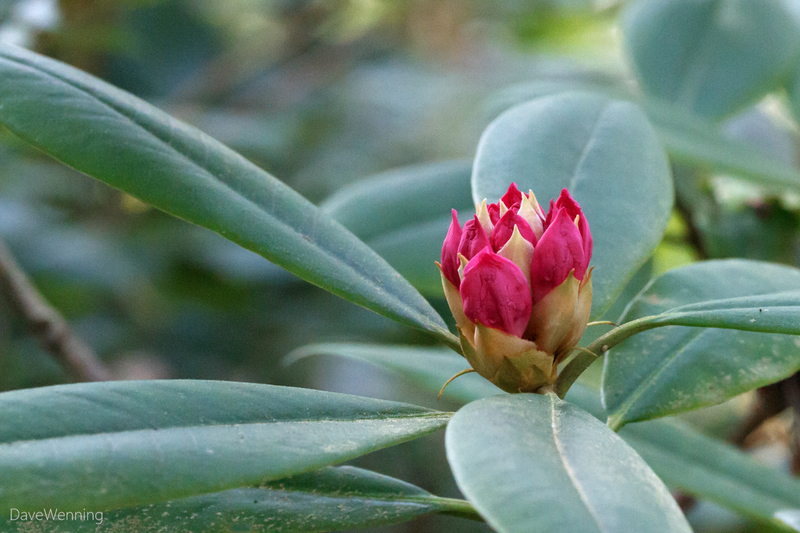 With warmer weather, week 5 brought a range of blooming from closed buds to almost fully opened trusses. Using my rating system of one to five stars, ★☆☆☆☆ to ★★★★☆. 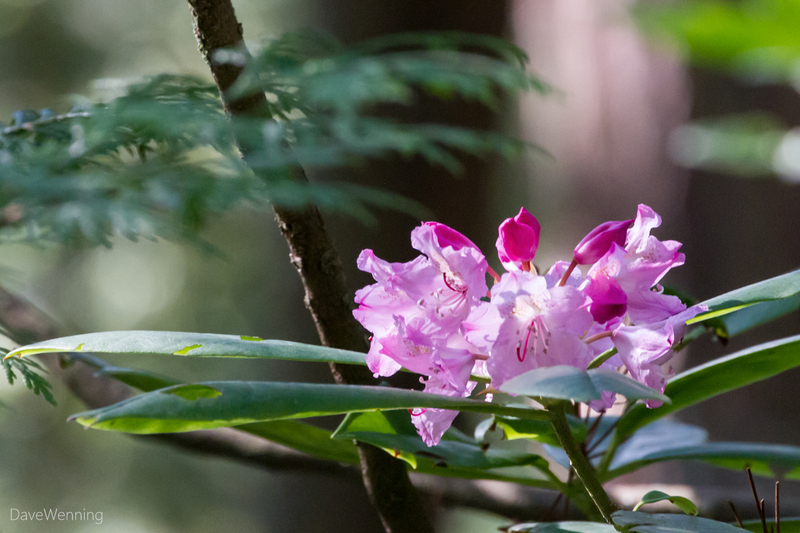 This coming week should bring some fully opened five star blossoms in the Deception Pass rhododendron grove. 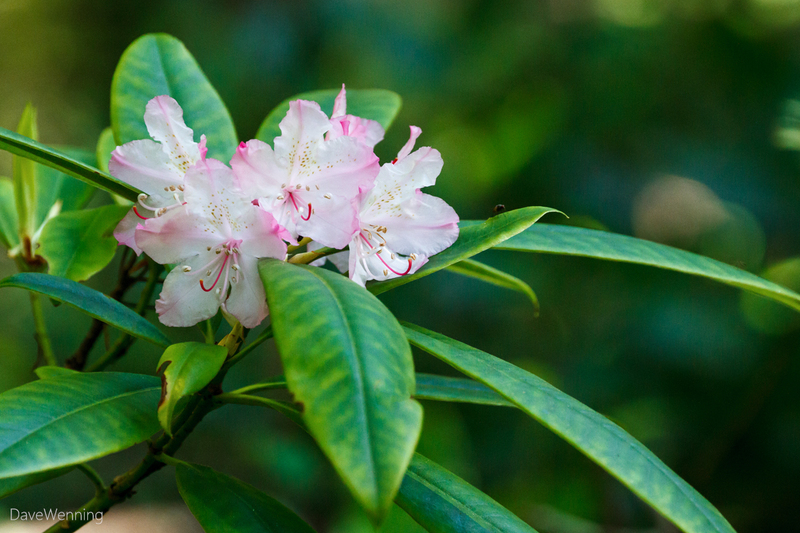 I am planning my next hike to the native Pacific Rhododendrons on Wednesday, May 6. If you would like to come along, we'll meet at 8:30 a.m. in the North Beach parking lot in Deception Pass State Park. I have posted more information about the hikes here. Elsewhere on the trails, Thimbleberry (Rubus parviflorus) is also blooming now. 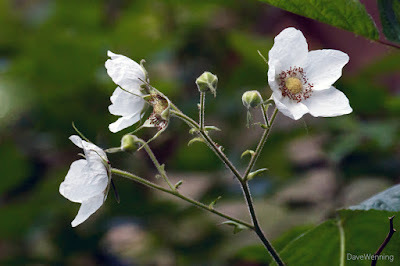 White flowers (instead of hot pink) and large, velvety, maple-like leaves distinguish Thimbleberry from its cousin Salmonberry. The latter are pretty much finished blooming now. 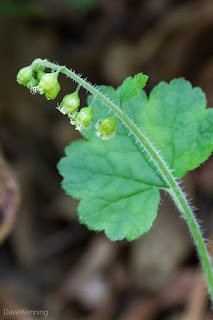 Fringecup (Tellima grandiflora) is one of several members of the Saxifrage family in the Pacific Northwest. 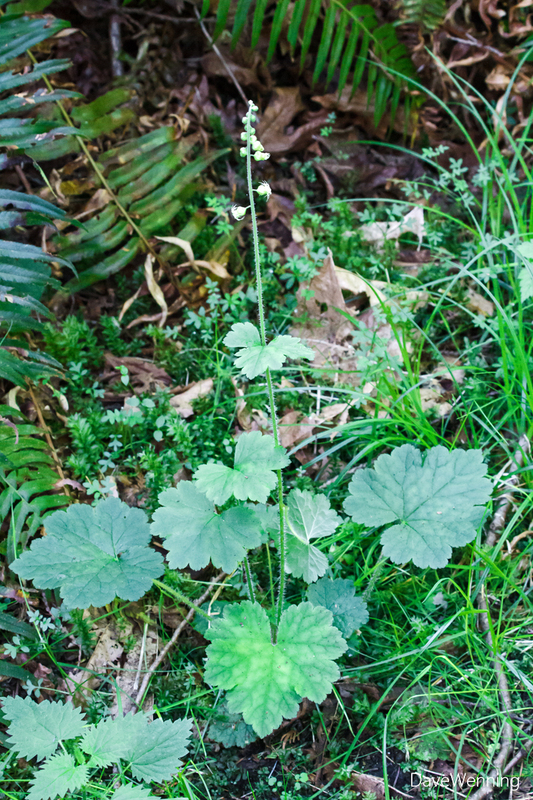 It is common along trails where the ground is damp, or around ponds. 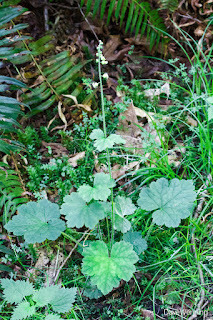 It comes up in my yard around the koi pond. 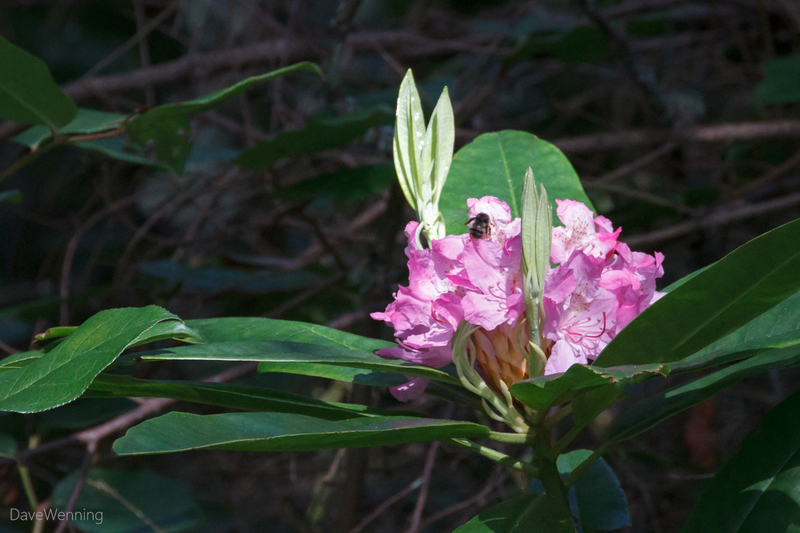 In the right photo, these flowers are not fully mature, but the source of the name "Fringecup" can be seen. Red Crossbills (Loxia curvirostra) are the subject of the wildlife photos for this post. These are not very good photos. I had to aim the camera through branches and leaves to get the shots. 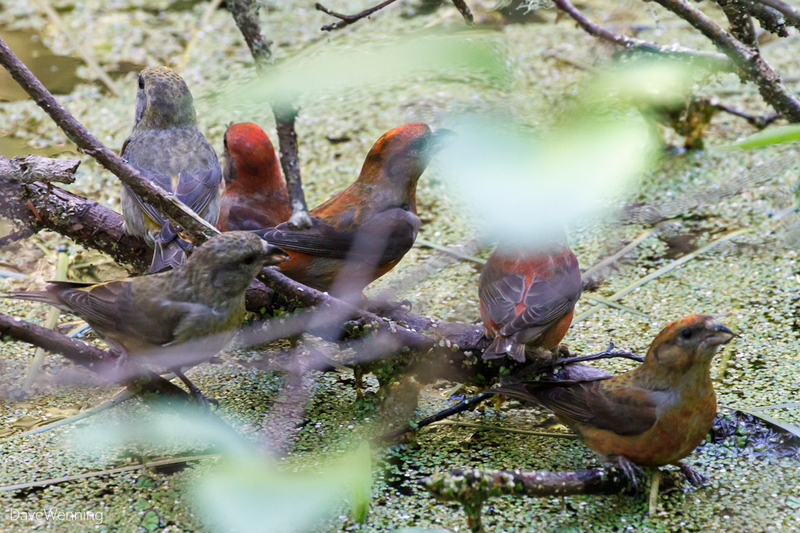 Nevertheless, I was excited to spot these large finches stopping for a drink in one of the ponds next to the Discovery Trail. 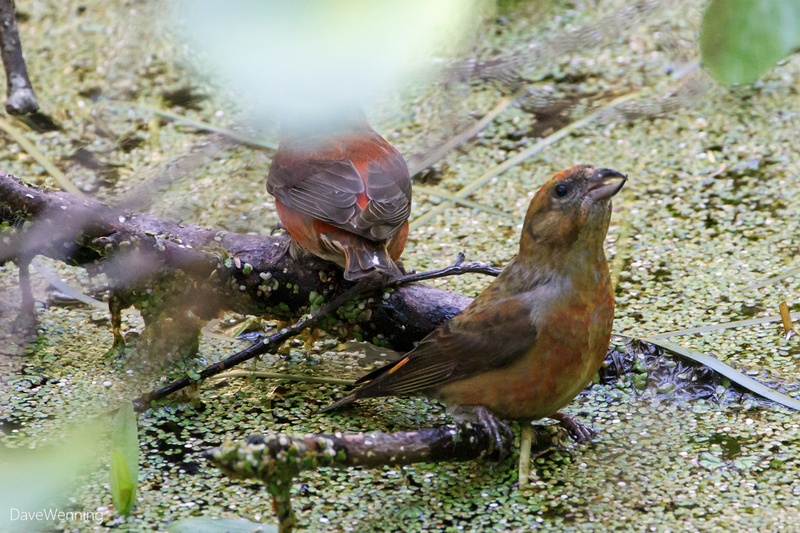 Such a group of Crossbills is called a "crookedness" or a "warp," according to iBird. 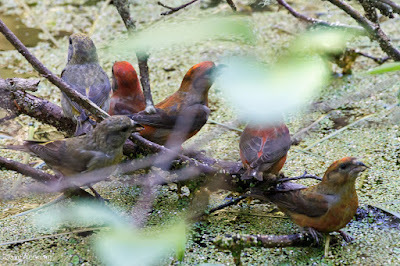 That specialized crossed bill is designed for extracting seeds from conifer cones. Variations in the bill shape is seen depending on the type of food preferred locally. It has been my observation that the upper mandible always crosses over to the left side. As usual, rhododendrons were not the only attraction on the trails of Deception Pass State Park.